The Guelph Storm are headed to the Western Conference Championship series. 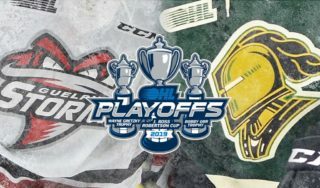 The Storm erased a 3-1 lead in Game 7 and a 3-0 lead in their series with the London Knights on their way to a 6-3 victory on Tuesday night at Budweiser Gardens. With the Knights leading 3-2 heading into the third period, Londoner Isaac Ratcliffe scored back-to-back goals to give Guelph a lead they would never give up. The Storm became just the fifth team in Ontario Hockey League history to come back from a 3-0 deficit in a seven-game series, joining the Windsor Spitfires — who have done it twice — the Peterborough Petes and the Ottawa 67’s. Ratcliffe ended the game with two goals and an assist for the Storm. Fellow Londoner Nick Suzuki had a goal and two assists, giving him 13 points in the last five games the Knights and the Storm played. Suzuki was named the OHL’s Player of the Week prior to Game 7. 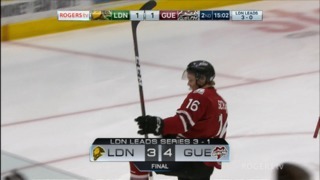 London had built their 3-1 lead in the game, scoring three goals in a span of 2:54 early in the second period, after Guelph had scored the only goal of the first period. The Knights outshot the Storm 34-28 in the game. Two posts and a crossbar were hit before the game’s first goal was scored. Isaac Ratcliffe of the Storm and Adam Boqvist of the Knights pinged pucks off posts at either end of the ice and Guelph’s Domenico Commisso rung a shot off the crossbar in the first ten minutes of the opening period. Oilers prospect Dmitri Samorukov was the first player to put a puck to the back of a net. The Storm defenceman kept a puck in at the London blue line, slithered into the slot and fired a shot past Jordan Kooy at 16:40 to give Guelph a 1-0 lead. Alex Formenton tied the game 1-1 on a Knights power play that sparked three London goals in a span of two minutes and 54 seconds. Formenton tapped in a puck that was slapped wide by Evan Bouchard, bounced off the end boards, off Guelph goalie Anthony Popovich and right to Formenton’s stick just 33 seconds into the second period. Connor McMichael brought the puck across the Storm blue line on a 3-on-1 and snapped a shot over the shoulder of Popovich at the 2:23 mark of period two. Just 1:14 after that, London’s Will Lochead rifled a puck at the Guelph net that was tipped into the top corner by Liam Foudy to give the Knights a 3-1 lead. 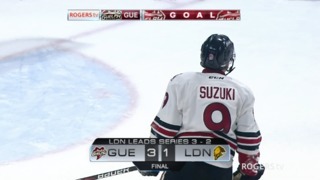 Londoner Nick Suzuki got the Storm to within one on a Guelph power play at 6:59 of the second as he snapped a shot into the Knight net and the rest of the period played out from there, pushing the teams into the third period with London ahead 3-2. Isaac Ratcliffe tied the game right off a faceoff in the London end at 2:54 of the third and then put Guelph ahead just one minute and ten seconds later on a pretty feed from Mackenzie Entwhistle. Entwhistle jammed a puck in at the side of the London net at 6:30 to make it 5-3 and then he finished the scoring into an empty net with just over four minutes remaining.